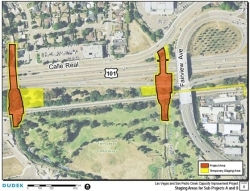 A project to improve the capacity of two culverts located along Las Vegas Creek and San Pedro Creek at U.S. Highway 101 near Fairview Avenue began in February 2014. This project is necessary because the existing culverts can only withstand a ten year storm event. The rebuilding of these culverts will increase the water capacity for a twenty-five year storm event. In previous years, properties north of Calle Real and U.S. Highway 101 have flooded several times, including sections of U.S. Highway 101. This project will also include rebuilding the U.S. Highway 101 southbound off-ramp at Fairview Avenue. Caltrans is the lead agency for this project, in partnership with the Santa Barbara County Santa Barbara Flood Control District with support from the City of Goleta. The contractor for this $16.6 million project is Flatiron West Incorporated of San Marcos, CA. LEI is providing scheduling and NPDES compliance support.